Today I have a review of the brand new Olight PL-2 Valkyrie weapon light. Olight provided me this light for testing and review and it has not influenced my opinions. Video is still my main thing and I would appreciate you take a look at that too. I have the Olight PL-1 II Valkyrie and have it on my Glock 19 for use in home defense situations. I did a video review a few months ago and had zero problems since. The PL-2 improves on just about every aspect of the PL-1, and is the second weapon light made by Olight. During this review I am going to compare other weapons lights to the Olight PL-2. I borrowed Streamlight TLR-1s from a friend to include. The Streamlight TLR-1s and Olight PL-2 are in direct competition since they both are similar sizes, weights, and both use 2x CR123A batteries. The packaging is typical of Other Olight products, with a small but nice cardboard retail box with a hanging tag. Relevant information is found on the front and back. Inside is a plastic container that has the light, manual, extra mount, and allen wrench. Olight includes 2 batteries preinstalled but uses a small piece of plastic to prevent accidental discharge in the package. This must be removed before first use. Comparing the Olight Pl-2 to the TLR-1s the Head is smaller and crenelated. The light is shorter in height and length and the same in width. The body itself is made from hard type anodized aluminum. The battery compartment is contoured to fit the batteries more tightly. I was critical of the PL-1 having plastic inserts to make it compatible with different guns rail systems. The PL-2 Improves this by making them from aluminium. Out of the box this came with the Glock sized rail preinstalled, but you get a 1913 rail piece in the box as well as an allen wrench to change it. The mounting system is very similar between the PL-1 and PL-2. The quick detach mount is very sturdy, and requires no tools to attach to the light. The attachment lever has some machined grip to it but does not include any rubber this time. It has spring tension on it when in the open position it should fall freely off the rail. I really like this easy to use quick detach with no tools required unlike the TLR1s that requires a screwdriver or coin to firmly attach and detach it to your weapon. Sometimes the best light is the one you have with you and you don’t always need to be pointing a gun at what you are needing to light up. The PL-2 is advertised as producing 1200 lumens through a CREE XHP 35 HI LED in Cool White, however those are peak lumens. Like many high output flashlights the PL-2 will step down in brightness to 600 Lumens when it gets hot. This is still more than the PL-1 which didn’t have an overheating issue. At 600 lumens it has a claimed runtime of about 70 minutes. In my testing after 1 minute of use it got to 98F. I continued this test for 5 minutes to see if it would step down in output and it 108F. The lense is a plastic TIR style lense. It creates a very hot center, minimizing spill. The Olight PL-2 can use 2X CR123A or rechargeable RCR123A cells. If using the rechargeables runtime won’t be as long. This is one case where I would recommend using Primary batteries for longer shelf life, and because the runtimes will be longer due to the reduced capacity of the rechargeable batteries. I went and shot about 350 rounds of 9mm and 40 S&W through a Glock 19 and a Glock 22 and had zero issues with this light. It attaches firmly and remains there. Unfortunately I was not the only one at the range this time and we couldn’t shut off the range lights. I didn’t have any trouble with the battery door coming open accidentally during shooting. The only problem I had was the lens got a little dirtyfrom gun powder residue. The RSO’s at my range were pretty interested in it too. After shooting with the light on it naturally gets coated in gun powder residue. It cleaned off fairly well with some Hoppies #9 but seems to have a rougher surface finish on the top of the bezel closest to the muzzle. Water resistance is listed as IPX6 so that means it’s highly water and dust resistant but isn’t rating for continuous water immersion. For normal use cases, even in the rain or dropping it into a puddle this should be fine but don’t take it diving. 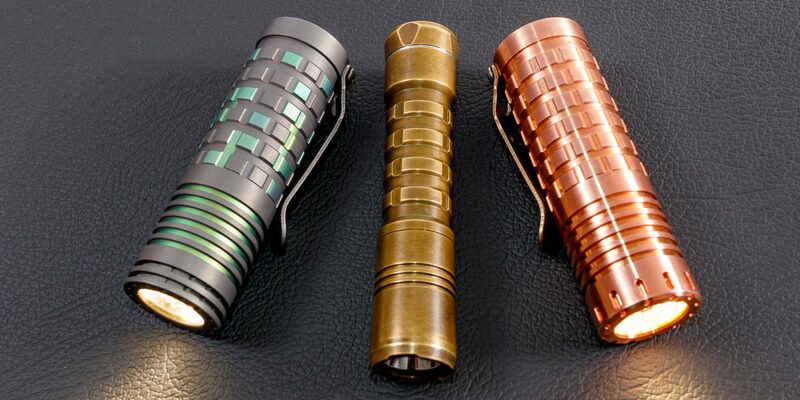 Olight has a new switch design and I really like it. It gives you a audible and tactile small click when you turn on and off the light. This is an improvement over the old more mushy switch on the PL1. It gives you more confidence to know what mode you are in. It works from both a front push or side push. If you click both sides of the light at the same time you get strobe. They retained the same interface though where you have to push both sides of the buttons to get strobe. This isn’t the easiest to do if you have smaller hands and impossible to do one handed without adjusting your grip each time. Streamlight with the toggle system on the TLR1 has Olight beat here. The battery door is pretty quick access. To access the battery compartment it should be removed from your pistol first, you then pull the lever back all the way 90 degrees from the body of the light and the door will hinge open. There is a small tab at the top/bottom of the light that keeps the door attached. There is gasket material on the door itself for water and dust protection. Inside at the bottom there is markings for polarity as well as on the top of the door. The Streamlight TLR-1s system is a bit more complex and over engineered. It uses springs as contacts and a larger tab to keep the door in place. The release is a spring metal and primes the door for opening. It’s easy to use as well but takes and extra second. Since this is a new light weapon light could not find any custom made holster options yet. This should get better as time goes on and the popularity improves. When I compare the Olight PL-2 to the Streamlight TLR-1s my takeaways are, the Olight is well engineered and built. For 99% of people that buy it, it will meet their needs very well. To me the Streamlight feels a bit over engineered and uses a better switch system. However the Streamlight uses older technology and LED’s at this point so 300 lumens isn’t much in 2017. Both lights will meet their intended purposes well. Olight has taken what they learned from the PL-1 II and incorporated user’s feedback into the PL-2. Boosting performance, reducing the height of the light, improving the mounting system, all while keeping the price under the competition. If you want a ton of light, from a small package and are ok with a 2x CR123A light, this is a great option with current technology from a company with a solid reputation. I like the Streamlight toggle buttons better then the Olights push buttons. If you are interested in purchasing you can do so at the links below.